Submarine Safaris SL was established in Lanzarote in the summer of 1997. We were the first and only real diving submarine on the island, which brought a new dimension to this wonderful island. It enables one and all to enjoy the wonders of the undersea world, from the very young to senior citizens. In 2007 we expanded the company and opened a new operation on the island of Tenerife. This has enabled us to reach a larger market so more clients can now participate and enjoy the magical mysteries below the waves. There are only 15 tourist submarines of our type operating in the world, so why not take this opportunity to experience the depths of the Atlantic Ocean. Dive up to 100ft without getting your hair wet. Our Submarines are worth more than 2 million pounds!! Our Submarines are based in Puerto Calero, Lanzarote (millionaires’ marina) and San Miguel Marina, Tenerife. You will arrive on our courtesy coach and then be escorted to our yellow submarine. Inside is seating for 44 passengers, with 22 huge port holes down the sides to view the vast array of marine life. 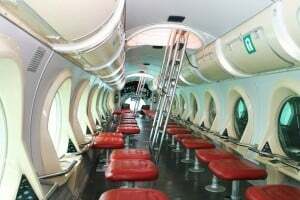 The submarine is fully air conditioned for your comfort. The moment you step on board you will already be able to see many fish swimming around the marina. As we start to dive, our guides will begin commentary for the duration of the excursion. Get your cameras and camcorders at the ready as you may come face to face with 8ft Rays, huge barracuda, angel sharks, parrot fish, bogue, groupers and many more. Shipwrecks lie on the ocean bed teaming with marine life simply a fantastic sight that has to be seen to be believed. At around 100ft the submarine will “park up” on the ocean bed. You will be able to walk around the submarine and take photos. Our scuba diver will join us at this point, performing his underwater ballet and hand feeding the amazing creatures of the deep right in front of your port hole. Simply unforgettable!! On the way back up to real world we encourage everyone to join in a chorus of ´We all live in a yellow submarine´. As we leave the beauty of the underwater world, you will be presented with your personalised dive certificate to prove you are one of few people in the world to have discovered the depths of the Atlantic Ocean. Submarine Safaris operate two of the world’s most sophisticated hi-tech tourist submarines. Our Submarines are named Sub Fun Tres – Lanzarote and Sub Fun Cinco – Tenerife. They have been designed and built specifically for the submarine tourist industry. Each submarine is built to a very high specification and cost over 3 million euros each. They are designed for safety and total comfort so our passengers can fully enjoy their diving experience. The cabin is spacious and is maintained at normal atmospheric conditions, so pregnant women, heart patients and persons with ear problems will not be affected in any way. Please visit our gallery here.